A significant shift in attitudes toward real-world use of mass spec in clinical settings was evident at this year’s meeting of The Association for Mass Spectrometry Applications to the Clinical Lab. Scientists at the San Diego conference agreed that implementing clinical use involves a great deal of expense and a daunting learning curve. A number of instrument vendors have responded by providing out-of-the-box solutions including training and support to get the system up and running. “This is the first year a high proportion of speakers were actually talking negatively about immunoassays and positively about chromatography and mass spec,” said Peter J. Stone, Ph.D., senior applications scientist at Agilent Technologies. Among those enthusiastic presenters was Brian Feild, Ph.D., life science applications chemist at Shimadzu Scientific Instruments. He presented work showing the use of core shell hydrogel particles called Nanotraps to enrich samples for biomarker discovery. Nanotraps are added to a biological fluid such as serum or plasma and incubated. After pelleting and washing, the captured proteins can be eluted. An additional benefit is that Nanotraps protect the trapped proteins from degradation by proteases. 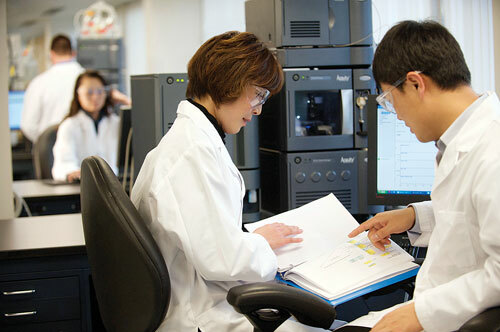 Shimadzu’s Nanotrap Biomarker Discovery Platform was developed to accelerate a biomarker discovery workflow by combining size exclusion and affinity capture to enrich for low molecular weight proteins, many of which are carried by high molecular weight excluded proteins. Dr. Feild scanned a set of non-small-cell lung carcinoma samples provided by George Mason University, using the Axima Performance MALDI-TOF MS. The analysis rapidly picked out differences between diseased and clear samples. The Nanotrap work flow could be applied to any disease where there is a need for lower abundant biomarkers. 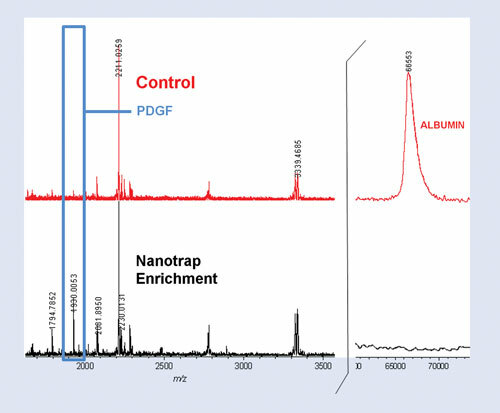 One-step enrichment of platelet-derived growth factor (PDGF) peptide (1930.0 Da) using Shimadzu Scientific’s Nanotrap particles: PDGF (60 ng) in the presence of albumin (600 ng) was processed with Nanotraps to sequester and enrich the extremely labile PDGF protein. Comparison of MALDI mass spectra of a control to a sample processed with Nanotraps demonstrates the capability to exclude abundant, high molecular weight proteins (e.g., albumin) and simultaneously amplify a low-level PDGF peptide (highlighted in blue), resulting in an eightfold increase in signal intensity (left). Bruker Daltonics’ MALDI-TOF MS-based system for identification of microbes, the MALDI Biotyper, combines instrumentation, dedicated software, and a reference database of more than 2,000 microorganism species. In his conference presentation on the topic, Markus Kostrzewa, Sc.D., director of molecular biology, R&D, reviewed the introduction of the system in clinical microbiology laboratories. The MALDI Biotyper is now routinely being used as a diagnostic tool in many European laboratories because it shortens time to results, reduces costs, and increases accuracy compared to conventional biochemical assays. Bruker designed the instrument to optimize ease of use by technicians in the biomedical field. “The MALDI Biotyper is probably the first MALDI-TOF platform that can be successfully used by a medical technician after a one-day training course,” Dr. Kostrzewa said. Results presented by Dr. Kostrzewa showed that in order for a mass spectrometry system to be introduced into a clinical routine it must be robust, simple to use, and deliver superior clinical and diagnostic performance. The provider of the system needs to provide a complete, ready-to-use product, with full support for the clinical laboratory. Most companies that manufacture mass spec systems are accustomed to serving research scientists who are less interested in a turn-key solution and more interested in the absolute best technical specifications, so this required a different approach. Lisa Calton, Ph.D., technical manager at Waters, presented a poster illustrating the automation of sample preparation for the analysis of plasma metanephrines by UPLC/MS/MS. She found that automated sample preparation improves repeatability, minimizes human error, and can enable traceability of samples with an onboard barcode reader. Dr. Calton used Oasis µElution SPE technology in 96-well plate format with the Tecan Freedom EVO 100 liquid-handling system to quantify plasma metanephrines. These assays are typically performed by HPLC using electrochemical detection—a method that involves labor-intensive pretreatment with long analytical run times. Plasma metanephrine is a marker for pheochromocytoma, a disease whose primary symptom is high blood pressure, with reported diagnostic specificity of 92% and sensitivity of 98%. Screening every patient who presents with high blood pressure using the labor-intensive HPLC metanephrine assay is not feasible. However, Dr. Calton and her colleagues demonstrated the ability to process a large number of samples with minimal operator involvement. Dr. Stone from Agilent addressed the need for pain-management assays to assess and adjust individual medication doses. The assay can also be used for monitoring illicit drug use. Dr. Stone used LC/MS/MS assays to analyze more than 80 compounds, achieving sensitivity of one-tenth the cut-off level for most analytes. The method incorporated dynamic MRM capabilities to increase the number of analytes and decrease the analysis time while maintaining high-quality data. The method paired a Zorbax Poro Shell 120 column with the Agilent 6430 QqQ Mass Spectrometer. Analytes included benzodiazepines, opiates, amphetamines, analgesics, and other pain-management drugs with their metabolites. Dr. Stone said that the innovation in the assay is not that it’s ultrafast (although at 6 minutes, it is very fast), but that it is so comprehensive. It can process up to 85 analytes at a time. Testing for that many analytes would tax the resources of a conventional analytic laboratory. Dr. Stone credited the dynamic MRM technique for the ability to look at so many analytes. With a predetermined window of retention time, the instrument can predict which analytes will come up when, and monitors those analytes specifically. Bryan Krastins, Ph.D., from the Thermo Fisher Scientific Biomarker Research Initiatives in Mass Spectrometry (BRIMS) Center, presented a poster on the development of a synthetic quality control standard for sample proteolysis. Many protein samples are prepared for mass spectrometry using proteolytic digestion. However, the results of such a digestion can be highly variable, and those results will affect the outcome of the mass spec experiment. Dr. Krastins developed a standard protein that could be used to monitor the quality of proteolytic digestion for mass spectrometry applications. The synthetic protein contained 42 amino acids containing eight isotopically labeled arginine or lysine residues. The protein produces four peptides upon digestion, which can be used to create calibration curves for SRM limit of quantitation (LOQ) and LLOQ measurement. Additionally, spiking the synthetic protein into a protein sample allows its use as an internal standard for the efficiency, reproducibility, and quality of the digested sample. AB Sciex has been investigating mass spec quantitation for some time. Christie Hunter, Ph.D., presented her research results using the TripleTOF 5600 System to perform MRM-like analysis. The goal of the experiment was to improve specificity by eliminating noise and interferences in an analysis of proteins in a complex matrix such as human plasma. The TripleTOF can mimic MRM/SRM data acquisition by performing looped high-resolution MS/MS experiments, then fragment ion XICs are generated by post acquisition processing to produce MRM-like data. The data was first extracted with a wide fragment ion-extraction window, simulating MRM specificity. Then, the data extraction was performed on the same data with a very tight window, generating very high resolution data.